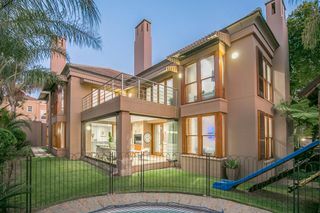 This is according to luxury home specialist, Ronald Ennik, CEO of Ennik Estates, who says it is the most evenly weighted higher-end suburb in Northern Johannesburg/Sandton, in the sense that there is a virtually equal three-way split of its 12 000 properties between cluster, sectional title and stand-alone freehold homes. "Now spread across 25 square kilometres, Bryanston has always been my market yardstick. It consistently provides the most accurate guide to the changing dynamics of the region's residential property sector as a whole by manifesting trends virtually as they unfold." A good example, Ennik says, is the current uptick in demand for and development of sectional title units, a recent revitalised trend in Bryanston that is now being followed in other suburbs that are key gateways to the Sandton CBD. He says Bryanston has shown that the shift poses no threat to the values of the old-established, full title and large, usually one-acre, properties that have long been synonymous with the area and which continue to hold their market values well. So much so that Bryanston has 88 homes valued at more than R20 million, according to the latest New World Wealth Report. Mandy Smith, Ennik Estates specialist for the area, says new registrations and repeat sales of sectional title units across Bryanston have been running way ahead of the comparative rate for estate and stand-alone homes. She says the process is illustrated by the hive of redevelopment activity along Bryanston Drive, particularly in the vicinity of the Riverside shopping centre. It is further emphasised by the fact that sectional title schemes now account for almost 40% of market stock in Bryanston. The underlying reason for this market metamorphosis is two-pronged, she says. "Firstly, young adults are now the predominant market force in Bryanston, accounting for around 45% to 50% of recent home purchases." They seek not only large spaces for their children, but also proximity to excellent schools such as St Stithians, the French School, Brescia House, Redhill and Michael Mount Waldorf, she says. Secondly, Smith says Bryanston is conveniently close to, but not directly impacted by, the vibrant and constantly developing Sandton business hub, where many Bryanston residents and homeowners work and conduct business. Downscaling by older, long-standing homeowners to a smaller, more manageable scale of living is another big factor. 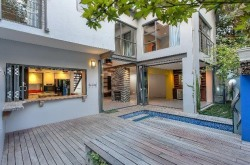 Smith says sectional title homes in Bryanston are fetching from R650 000 for a one bedroom unit, to up to R4 million. She says cluster and stand-alone freehold homes, on the other hand, generally start at around R3.5 million and range to R25 million plus. In the year to November 2014, there were 263 new registrations in Bryanston of sectional title homes (together valued at R374 million), compared with 36 estate homes and just seven freehold residences, according to Lightstone. During the same period, there were 551 repeat home sales in Bryanston, valued at just under R1.7 billion, of which full title cluster and stand-alone homes together accounted for R1.3 billion. Ennik says one of the joys of marketing Bryanston is that prices are usually driven off a platform of strong competition among prospective buyers for properties offered across the board, but particularly in the sectional title arena.